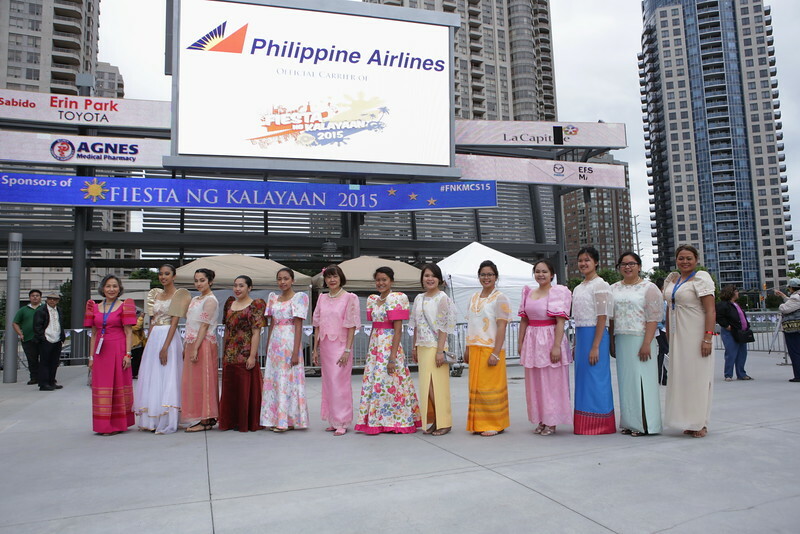 Fiesta ng Kalayaan is a West-end family oriented outdoor celebration of the Philippines. This year the rain began before the festivities commenced at Mississauga Celebration Square. The rainfall did not deter the spirit of celebrating our national day of independence as the Kalayaan Cultural Community Centre’s Rondalla group played Filipino folk songs to signal the start of the day. Fiesta ng Kalayaan’s Children’s Voices braved the rain to show the pride for their homeland in the singing of the Philippine national anthem “Lupang Hinirang”. Relatives of the Voices stood in solidarity with their young ones to celebrate and applaud them for their effort. To keep the patriotic spirit going Filipino-Canadian soprano Lilac Caña graced the stage and amazed with her rendition of Ako ay Pilipino. As in the past, the rich cultural heritage of the Philippines was showcased by none other than Culture Philippines of Ontario and the Fiesta Filipina Dance Troupe through traditional folk dances. In addition the Santacruzan reynas in their lovely flowing dresses accompanied by their escorts in barongs performed a cotillion. Not to be forgotten, the younger generation Musika Mississauga Children’s Chorus, Josie De Leon’s School of Performing Arts students, as well I Rock the One presented enjoyable performances to embody the nation’s talents. The true spirit of the celebration was visible in the excited and anxious faces and heard in the appreciative cheers of those who in true fan-dom fashion showed up in undesirable weather conditions for the appearance of their superstar: ABS-CBN’s chinta princess Kim Chiu. The time was naught when Ms. Chiu was escorted to the stage to greet her many die-hard fans with “Mr. Right” a song from her album Chinita Princess. Her fans were wild with excitement. Kim Chiu expressed her happiness at being part of such an event. As a special treat and to thank all of those who came out a special meet and greet was organized so that all could have an opportunity to say hi and have a photo with the star. The weather may have rained on the festival but it did not rain on the heart and spirit of the event. Such an undertaking could not have happened without the funding support from the City of Mississauga supplemented by the major sponsorship of TFC, KPMG, and Word Vision - Pinoy Para sa Pinoy. The food as well as the commercial and business vendors are always integral participants in making this yearly undertaking a reality. This seems to be the clear message that the adoring fans of Kin Chiu showed her inspite of the rainy Saturday at Mississauga Celebration Square. A yearly festivity undertaken by Fiesta ng Kalyaan for the past 5 years in partnership with TFC was blown away by a force of nature. As the saying goes, the show my go on and that's exactly what happened. Kudos to Word Vision - Pinoy para sa Pinoy and KPMG as the major sponsors for this year event. They were there and Kim Chiu cannot be stopped from going on stage to delight the awaiting fans with a pair of songs. Happy ang lahat ng makita siya! In coordination with TFC organizers, all those who braved that rain and cold weather were invited inside an Auditorium to have a photo op and selfie with Kim Chiu. Go! Go! Go!